An autoimmune disease that can affect many parts of the body. Systemic Lupus Erythematosus (SLE or Lupus) is an autoimmune disease that can affect many parts of the body. It is more common in females and in certain ethic groups. Most patients have mild disease resulting in skin rashes and joint inflammation but some patients can present with more serious manifestations affecting the organs. It is one of the autoimmune diseases associated with an abnormal blood test called antinuclear antibodies (ANA). However, these antibodies do not cause this disease. As a matter of fact, most patients with a positive ANA do not have an autoimmune disease at all! What are the clinical symptoms of lupus? 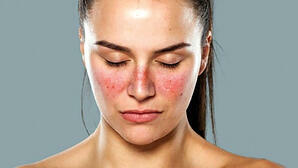 The skin rashes seen in Lupus vary significantly from the often-described butterfly rash on the face and cheeks. The rash may be more generalised affecting the limbs and trunk and they can occasionally resemble hives, psoriasis or eczema, making it difficult to diagnose. Sometimes we need the help of a dermatologist for a skin biopsy to confirm such. These rashes tend to come and go and can last weeks to months. They demonstrate variable response to topical treatment but more often they require systemic immunosuppressant therapy. Joint pain is common in patients with Lupus. It can range from arthralgia (pain without swelling) to inflammatory arthritis in a pattern that resembles rheumatoid arthritis. In contrast to the erosive disease we see in rheumatoid arthritis, Lupus arthritis is often not erosive but can still lead to a degree of deformity. One form that is often described is Jaccoud’s arthropathy which affects the fingers and wrists. Perhaps the next more commonly seen manifestation of Lupus is serositis, a term we use to describe inflammation of the lining of our organs such as the heart, lungs and the abdominal cavity. Pleurisy is a term we use to describe inflammation of the lining of the lungs, pericarditis is inflammation of the lining of the heart and peritonitis is a result of inflammation of the lining of the abdominal cavity. Patients can present with chest pain and abdominal pain, which mimics other conditions such as chest infection, heart attack or even appendicitis. It is common to see slight abnormality in various blood parameters, especially when disease is active. Patients can have anaemia, low white blood cell count and low platelet count, but they may not need treatment if the readings are mildly reduced. Some patients carry antibodies that can result in clots in arteries and veins leading to strokes and heart attacks, or even damage to other organs such as the spleen and gut. These patients may need lifelong blood thinning treatment. Kidney involvement can range from mild leakage of protein in urine to severe inflammation, which if left untreated, results in renal failure requiring dialysis. Fortunately, most patients with Lupus do not have this form of kidney disease but it still requires surveillance with periodic blood and urine tests. Vasculitis can occur in patients with Lupus. This can present as a distinct form of lower limb rash or even skin ulceration. Vasculitis can also cause narrowing of larger arteries which supply muscles and organs, leading to muscle pain and organ damage. There is a higher incidence of headaches and migraine in patients with Lupus. Rarely Lupus can result in inflammation of the central nervous system such as the nerves and even the brain, resulting in various neurological symptoms. Perhaps one of the least well-understood manifestations is ‘neuropsychiatric Lupus’, when patients present with severe depression or even psychosis. There may be an autoimmune or inflammatory aetiology and patients may require immunosuppression. How do we diagnose Lupus? The diagnosis of Lupus requires both blood tests and clinical features consistent with Lupus. Having an ANA without a clinical problem does not mean you are at risk of Lupus. Your Rheumatologist will order more specific blood tests for Lupus (dsDNA, ENA, complement levels) if Lupus is suspected. These tests are more specific for Lupus. There are international classification criteria (ACR, SLICC) for Lupus but they are developed to help doctors to standardise patient characteristics for research purposes, rather than to diagnose an individual patient. Your Rheumatologist can make a diagnosis of Lupus even if you do not fulfil the full criteria. How do we treat Lupus? Lupus is a disease that can affect different organs, so it is common for your Rheumatologist to collaborate with other specialists (Cardiologist, Neurologist, Renal physician) in the management of your condition. Like many autoimmune diseases, disease activity in Lupus can fluctuate a lot. Patients need more treatment when disease is active and treatment can sometimes be reduced if the disease is inactive. Occasionally patients can come off treatment after careful tapering supervised by a Rheumatologist. Every patient is different and treatment is individualised depending on the clinical manifestations and severity of the illness. If you have reached this point of the article I suspect you may have Lupus or you know someone who has Lupus. You may have heard horrible stories and seen scary photos on the internet on this condition. In reality, most patients have mild disease and live a normal life whilst on treatment. Do not panic if you have symptoms suggestive of Lupus which are yet to be investigated. You need to speak to your G.P. to have further investigations and perhaps seek an opinion from a Rheumatologist.